Magnetic Resonance (MR)-guided needle steering offers several advantages over the traditional ultrasound-guided interventions. MR images offers a high soft tissue contrast, where an early stage tissue lesion is visible. 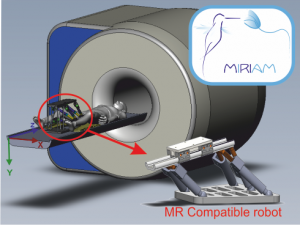 However, the clinical use of a fully autonomous MR-guided needle steering is still not accomplished due to aspects such as MR-compatibility, low frequency rate of MR images and autonomous MR-based needle tracking. Recently, a feasibility study of MR-guided flexible bevel-tipped needle steering has been performed in gelatin phantoms. Flexible bevel-tipped needles deflects when inserted into the tissue and can be steer towards the target by applying needle rotation along its own axis. The results achieved so far show that targeting accuracy may vary according to the target location. This happens because depending on the needle entry point and orientation, the target might be unreachable. Therefore, a pre-operative planning to define the best entry point is important to reduce the targeting error and guarantee the success of the procedure. Project: The aim of this research is to develop a pre-operative planner in order to improve the MR-guided needle steering by choosing the best insertion location and orientation. The needle entry point will be selected based on a planned needle path and according to criteria such as shortest path, distance from obstacles or number of needle rotations. The needle path can be planned using the needle-tissue interaction model. This project will extend the previous work on MR-guided flexible needle steering by developing a pre-operative insertion planning and performing experiments in biological tissues. 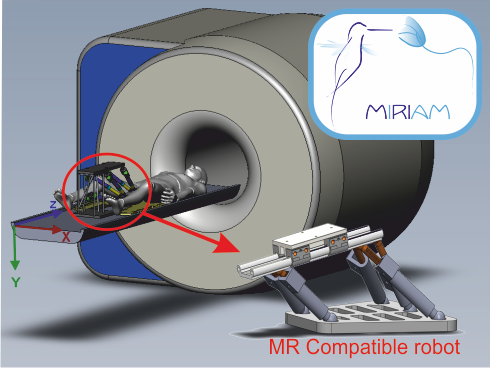 The experiments will be performed using the new MR-compatible robot that is being developed in the MIRIAM project.